Because when you buy an SRT Jeep, you want to make sure it'll beat whatever obscure challenger that shows up. There’s only a few times in life where 468 horsepower is a bit of a joke. Under the hood of a Dodge Challenger? Not so much. But a Jeep Grand Cherokee SRT? That’s where things fall a bit on the good-natured side of the line because even though the 6.4-liter Hemi V8 may have ample grunt, a performance SUV with that sort of power doesn't yet qualify as scary the same way a 707 Grand Cherokee Trackhawk does. Okay, so maybe with a 0-60 mph time of 4.5 seconds, this Jeep isn’t too slow, but the only way to get an idea of what it looks like is to hand the keys to UK drag racing champion Stuart Doignie to race it against a Hemi Hot Rod Coupe at Santa Pod raceway. Though this is a Jeep/FCA plug, the Hemi Coupe is actually a 1930 Ford Model A Coupe. It’s just been stripped down and rebuilt with a 1956 330 cubic inch (5.4-liter) Desoto Hemi V8 after the body was placed on a 1932 Ford chassis. 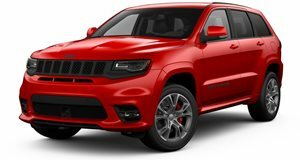 As fast as it looks, the 304 horsepower engine is no match for the modern Jeep, getting down the drag strip in 14.2 seconds at 95 mph compared to the Jeep’s 13.3 second time at 103 mph. Let’s keep these horsepower wars going shall we?